Like many others, we found ourselves shocked and appalled by the events described in the blog post by the former Uber engineer. Her experiences, like those of so many women before, we not something that should have occurred. 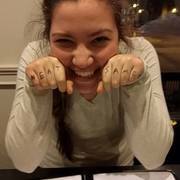 Because of this, and the fact that every 98 seconds an American is sexually assaulted, we decided that we should create a sort of social media site for women and allies who have had to deal with similar injustices. 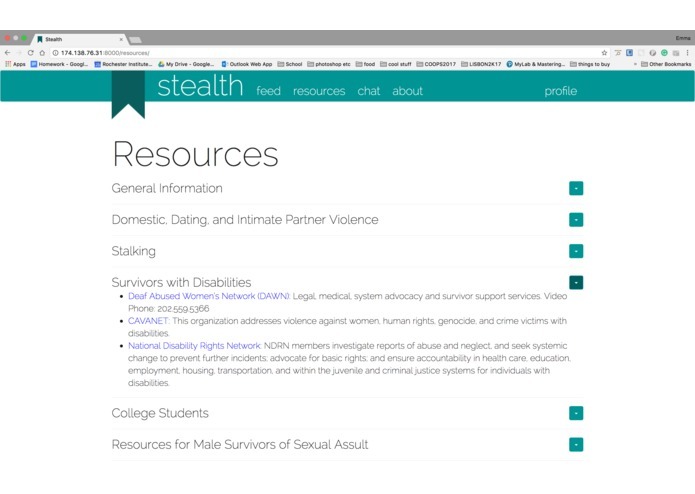 Our name, stealth, is a reference to the teal used for the Sexual Assault Awareness ribbon (imagine: sTEALth) and the fact that users may want to keep their identities and stories private, or stealthy if you will. 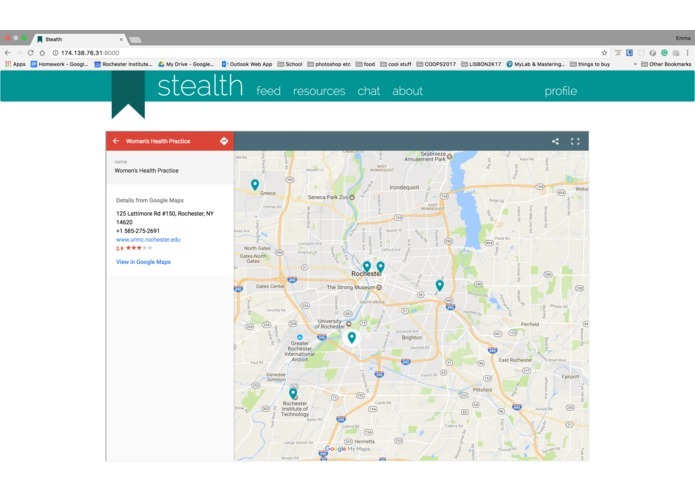 Our site, stealth, has a map feature that will show you local resources, from health clinics to law offices. By giving users the option to enter their own zip code, we don’t have to use the location of the user so we can help them feel more secure. Our website has a feed where users can post and comment on the experiences of others. By authenticating a user's profile and requiring log-in to post, as well as having a comprehensive report and block feature, we are providing our users with safety. 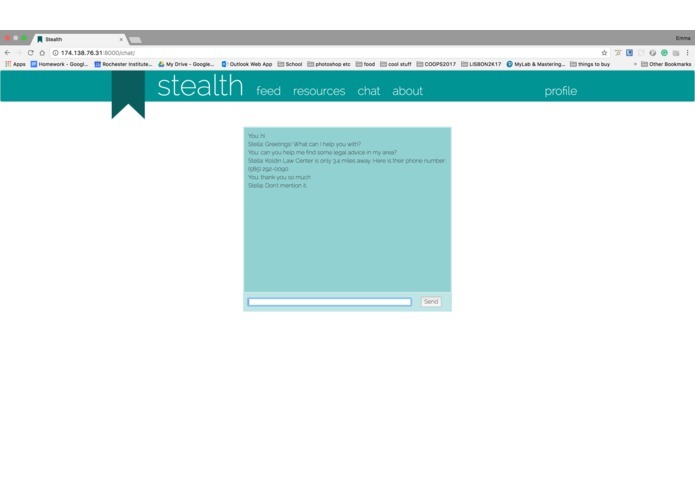 The anonymous posting option also allows users to stay anonymous, however, they are promoted to keep specific identifiers out of their posts in case someone involved or someone they know also happens to be on this site. The resources tab offers external resources for a wide range of services, from government-sponsored departments to online chats and hotlines available 24/7. We hope our users can find what they need and we realize we are not the only site that can provide them with the support they require. Our AI Chat bot, Stella, can provide you with other specific resources based on the information you provide it. 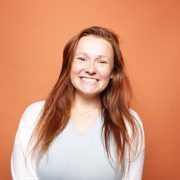 If you give Stella your zip code and ask it for legal advice, Stella can link you to the website of a local law office that can provide you with the assistance you need. She's also there for you if you just need to vent! 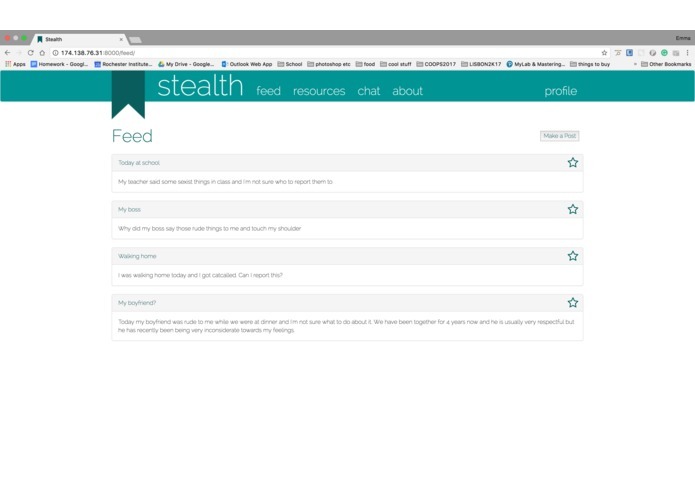 Your profile page will keep track of all the posts you make and follow, even if you have done so anonymously. This way, you are able to go back to see if someone has offered you any support or has any ideas for how you can handle the situation. I worked on the chatbot AI's machine learning. I also worked our hosting and server side interactions. I worked on creating the backend in Python and setting up our database. Front-end web developer and worked with Bootstrap to create our awesome website! 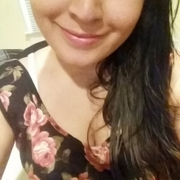 Second Year Game Design Student at RIT!